Premise-based solutions require a high initial capital investment as well as high recurring support costs to manage, maintain, and upgrade the technology. Cloud solutions offer predictable monthly costs. With cloud communications there is no need to purchase lots of on-site equipment and therefore expenses become operational rather than capex based. The management of an on-premise solution can be very expensive. Because of the complexity of today’s communications systems, it often takes an entire IT department to effectively manage the solution. A cloud-based solution means that you can outsource all the cost and work to the manufacturer who takes care of the 24 / 7 / 365 management. With our Cloud offerings, you can focus on your other IT initiatives. Technology - The refresh cycle on technology solutions has shortened to an average of three years. This represents an obstacle for companies as the ongoing technology upgrade becomes a major capital investment. With an on-premise solution clients must continue to make large capital investments on new hardware as they grow. They are also left with extra hardware if they downsize. With a cloud-based solution new offices and users can be set up through a self-administered client portal or by calling customer service. It is easy to scale up and down based on your business needs. With a premise-based solution, a challenge can lie in managing multiple vendors for implementation and support, handling separate billing relationships, increased demand for technical experts on multiple platforms and ongoing maintenance, support and upgrade requirements. 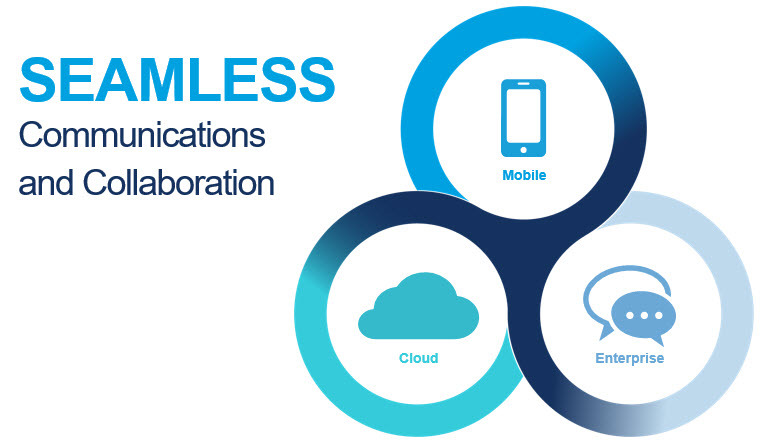 With cloud-based solutions you often have only one vendor for all your communication needs - voice, data and applications. An on-premise solution is only as reliable as the design and implementation. To guarantee up time equipment must be managed by an internal IT department. Cloud-based solutions maximize up time and coverage.